In my 2016 Spark Summit presentation Finding Graph Isomorphisms in GraphX and GraphFrames I reviewed the history of graphs in Spark, and how to query a graph in Spark GraphX required many more lines of code than an equivalent query in Neo4j using its Cypher language. Even Spark GraphFrames, which implements a tiny, tiny subset of Cypher requires more code than full Cypher. We look forward to bringing Cypher's graph pattern matching capabilities into the Spark stack, making graph querying more accessible to the masses. 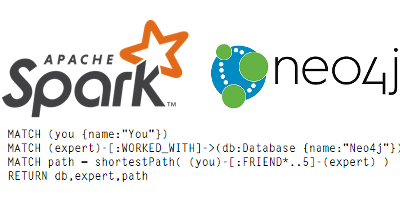 Neo4j, a leader in connected data, announced that it has released the preview version of Cypher for Apache Spark (CAPS) language toolkit. [...] Until now, data scientists have been using Spark and query tools like GraphX to define extensions to their graphs. Once identified, they would then re-implement and deploy that work within their applications. Now, with Cypher for Apache Spark, these scientists can iterate easier and connect adjacent data sources to their graph applications much more quickly. [...] This announcement builds on Neo4j’s unveiling of openCypher in October 2015, as an effort to push the whole graph industry forward by tapping into the open source community and making Cypher’s evolution an open exercise while avoiding redundant research.